Paris, 8 June 2016 – GenSight Biologics, a biotechnology company discovering and developing novel gene therapies for neurodegenerative retinal diseases and diseases of the central nervous system, announces additional promising results of its Phase I/II study, designed to demonstrate the safety and tolerability of GS010 in 15 patients with Leber’s Hereditary Optic Neuropathy (LHON). Each cohort of three patients was administered an escalating dose of GS010 through a single intravitreal injection in the eye most severely affected by the disease. Recruitment was completed in April 2015. These patients had an average onset of disease of 6 years. 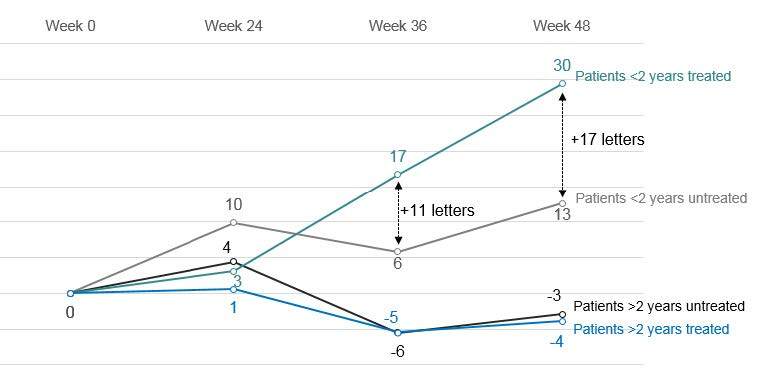 At 48 weeks post-injection, in patients with an onset of disease of less than 2 years, a gain of +30 letters (-0.59 LogMAR) was observed in the treated eye and +13 letters (-0.25 LogMAR) in the untreated eye, a difference of 17 letters in favor of the treated eye. No significant difference was observed in patients with an onset of disease of more than two years. The combined effect of the administered dose and the time from onset is noticeable at 36 weeks and stable after 48 weeks. GS010 targets LHON, a rare maternally inherited mitochondrial genetic disease, characterized by the degeneration of retinal ganglion cells that results in brutal and irreversible vision loss that can lead to legal blindness, and mainly affects adolescents and young adults. GS010 leverages a mitochondrial targeting sequence (MTS) proprietary technology platform, arising from research works conducted at the Institut de la Vision in Paris, which, when associated with the gene of interest, allows the platform to specifically address defects inside the mitochondria using an AAV vector (Adeno-Associated Virus). The gene of interest is transferred into the cell to be expressed and produce the functional protein, which will then be shuttled to the mitochondria through specific nucleotidic sequences in order to restore the missing or deficient mitochondrial function. Gensight Biologics is currently conducting two Phase III clinical studies (Rescue and Reverse) in Europe and the United States to assess the efficacy of GS010 in patients affected with LHON due to the ND4 mutation, with an onset of vision loss of less than one year. The top-line results at 48 weeks follow-up are expected in late 2017. GenSight Biologics S.A. is a clinical-stage biotechnology company discovering and developing novel therapies for neurodegenerative retinal diseases and diseases of the central nervous system. GenSight Biologics’ pipeline leverages two core technology platforms, Mitochondrial Targeting Sequence (MTS) and optogenetics, to help preserve or restore vision in patients suffering from severe degenerative retinal diseases. GenSight Biologics’ lead product candidate, GS010, is in Phase III trials in Leber’s Hereditary Optic Neuropathy (LHON), a rare mitochondrial disease that leads to irreversible vision loss in teens and young adults. Using its gene therapy-based approach, GenSight Biologics’ product candidates are designed to be administered in a single treatment to each eye by intravitreal injection in order to offer patients a sustainable functional visual recovery.